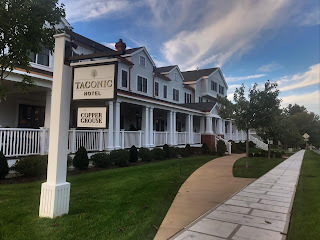 We loved staying at the TACONIC hotel in Manchester, Vermont. We were lucky to get the last room at a walk-in rate during Fall foliage season. The hotel is a little over two years old, and is a big difference between the many historic B&B's in the area. If you are looking for first class accommodations and service, the Kimpton Taconic Hotel is for you. They have an afternoon beer and wine social hour from 5 - 6 pm. We took our drinks outside and sat by the fire pit. It was a lovely evening. The Copper Grouse tavern is located inside the hotel. Make sure you make a reservation in the busy season. We didn't, so we drove down the street to Season's restaurant and had a nice meal at the bar. Located nearby is the Orvis Flagship Store. A popular place for breakfast nearby is Up For Breakfast. Plan on a wait. Across the street is cute shopping at Spring & Harbor. Manchester has been known as a destination for outlet shopping, but that's changing, and you can find more locally owned stores around. Welcome to Kimpton Taconic Hotel, a Kimpton boutique hotel that brings to mind grand leisure inns of days past, while artfully bringing to life all your modern hospitality whims. Surrounded by mountains in this picturesque village, Kimpton Taconic offers couples, families and wedding parties a free-spirited take on a New England escape that’s both classic and highly curated to your preferences. Call it quintessential Vermont with a fresh twist. "Best Hotels in Vermont, 2018"
- Nightly manager-hosted evening social hour from 5 p.m. – 6 p.m.
- On-site boutique featuring seasonal, handcrafted collections. Nearby is the Weston Playhouse. We saw a great play, Two Trains Running, with NYC actors, including my friend Guiesseppe Jones. 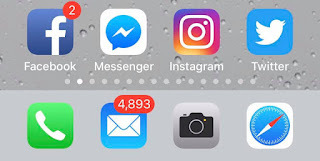 The most recent iPhone iOS update deleted Instagram, Messenger, and Twitter ICONS from my iPhone. The Apps are still there. No icons. You USED to be able to go into Mac OS iTunes to rearrange your iPhone icons, but Apple removed that feature. Now you have to use an App called Apple Configurator 2, but that requires the most recent Mac OS, which isn’t compatible with my 2011 MacBook Air. They need to fix it. One way around this is to delete apps from your iPhone, power off, then power on the iPhone. 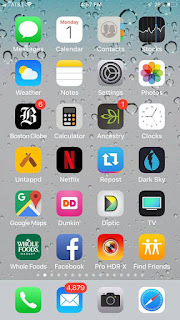 It took me three tries, but after I deleted enough apps, the missing icons came back. Then I moved them back to my first page.